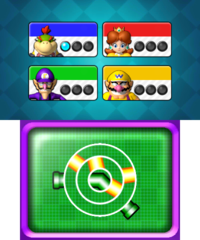 Puzzle Pronto (Puzzle Hamper in the British English version) is a General minigame in Mario Party: Island Tour. The screen is split into four sections. One of them, which is randomly chosen, expands to the whole screen. Players must tap all the Super Mushrooms that roam around the screen. The first round contains five Mushrooms, the second one six, and the last one eight. Players must choose the picture that matches the silhouette. Players must rotate two rings with parts of a Warp Pipe to align them. In the first stage, the pipe is straight. In the second stage, the pipe is bent. In the third stage, it branches into two pipes. Players must tap circles with numbers in ascending order. The first round has four circles, the second one six, and the final one nine. Only one of them is picked for all the competitors to play. The person who clears the three stages from the chosen game first wins. Rules – American English "Solve 3 Touch Screen puzzles as quickly as you can." Rules – British English "Solve three rounds of a randomly selected puzzle as quickly as you can." This page was last edited on April 10, 2019, at 11:38.